Having a lawn means being on the lookout for all kinds of grass damage. Animals of all sizes can have a negative impact on a lawn. This includes dogs. Man’s best friend can be a lawn’s worst enemy if precautions are not taken. There are steps you can take to prevent lawn damage from animals big and small. Check your lawn for grubs. These creatures are very appetizing to animals like raccoons and skunks. If you find grubs, bigger, more destructive animals are likely to follow. Watch out for moles. These animals can be nasty on a lawn. They can create tunnels and dirt mounds that can destroy a lawn. Here’s how extensive mole damage can be: Moles can damage underground irrigation systems. Skunks and raccoons are diggers too. They will go looking for food at night and tear up your lawn in the process. They like grubs, so this is another reason to keep grubs out of your yard. One of the best ways to get rid of grubs is by using a grub control treatment application. It’s important to remember that the best prevention against grubs is a healthy lawn. A strong, green lawn that is cut regularly and receives a healthy amount of water, will have more nutrients to fight off grubs. 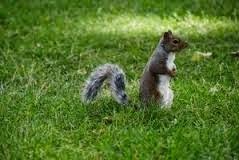 No grubs means less chance of animals like skunks, raccoons, moles and squirrels will do damage to your lawn. There are also ways to minimize the damage dogs can do to a lawn. Mowing the grass high in areas affected by dog urine can help the lawn recover. You can also flush those affected areas with water as soon as possible. You can also gate off one area of the lawn and designate this as the dog’s area. This might also be helpful if the dog likes to dig in the lawn.